Revenge isn’t that simple like it used to be when we were kids: if someone threw a rock at us, we picked another and threw back at that person. As we grow up, more steps are needed for someone to be able to give a satisfying payback. The bitterness of the process totally disappears with the sweet revenge, but would forgiveness be sweeter? 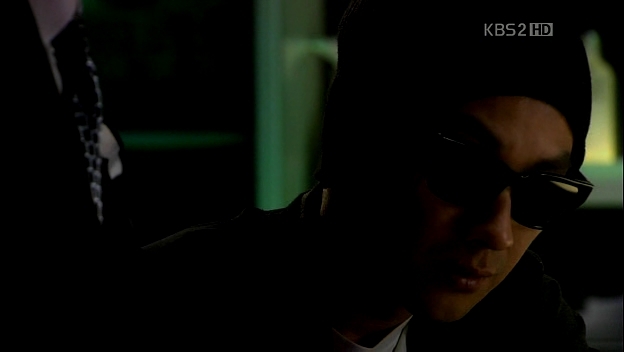 As Jang-Il leaves and Sun-Woo showing that he’s no longer blind, he walks out of the cafe. He crosses the road and we are brought back to the time when he had his first surgery. The surgery wasn’t a success and Sun-Woo looks slightly dejected although Tae-Joo decided to do another surgery. They went for a drink and talked about Jang-Il. Sun-Woo told Tae-Joo everything about the friend and he sounds upset when he stated that they were best friends. He did feel some pity towards his friend, but Tae-Joo knows best that Sun-Woo can’t forgive Jang-Il until he trampled over him. 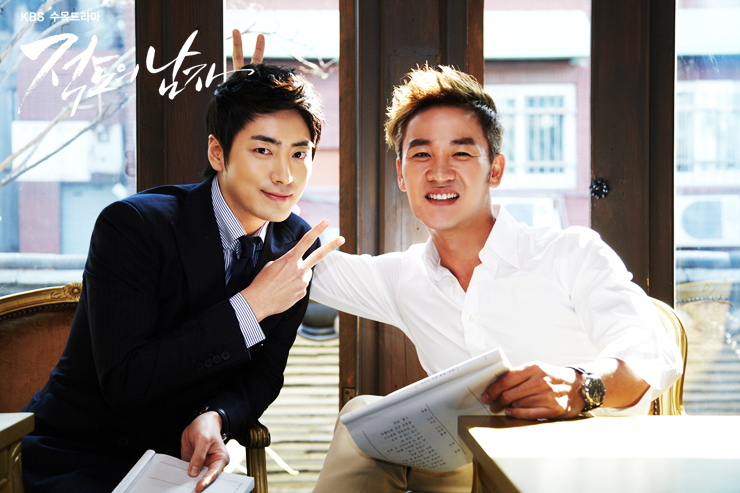 Jang-Il passed the bar exam, while Sun-Woo threw a tantrum when he’s told to close his eyes again for another surgery. Tae-Joo told him about the note Ji-Won wrote for him on the back of her photo, but he wanted Sun-Woo himself to read what she wrote. So he complied and went for the surgery. Luckily, this time it went well and he opened his eyes to the smiling Ji-Won in front of his eyes. Tae-Joo held the picture in front of Sun-Woo as he knew that Sun-Woo would want to see her face first, not his. Awww. Sun-Woo took the picture into his hands with mixed emotions and he finally got to read the confession Ji-Won made on the picture. He realized that he was too late, but he never looked back and continued to move forward. Ji-Won graduated and received a big bouquet of flowers from an anonymous. Sun-Woo, on the other side of the world, started studying in a university, where Yun-Joo also went for her studies. They looked quite close, so I assume they both took economics at the university. He went by the name David Kim and studied hard. It’s already Christmas and Ji-Won received another bouquet, this time with a postcard from London. She thought that it was from her friend, but she was wrong. 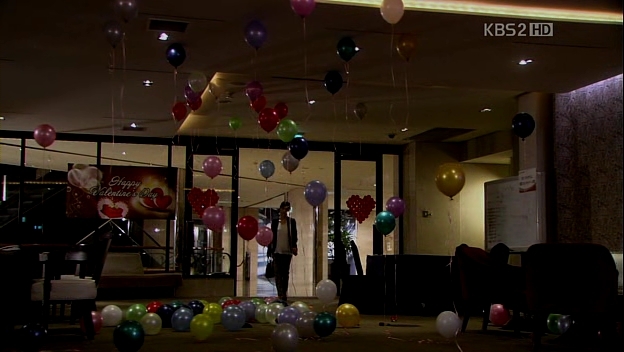 She even got her workplace full of balloons on her birthday, not forgetting the usual anonymous bouquet. Although she had started working, she still spent some time doing volunteer job at the rehab center. She tried to ask about Sun-Woo’s whereabouts, but the manager herself never heard about him after he disappeared. After years of his hard work, Sun-Woo managed to graduate and Tae-Joo congratulated him. He wanted to know the reason Tae-Joo decided to help him. He told Sun-Woo everything he knew, except who is Sun-Woo’s birth father. 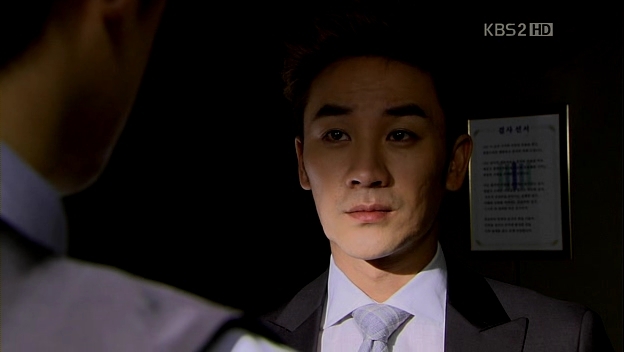 He reminded him not to do anything mindlessly as they didn’t have any proof about Chairman Jin murdering Kyung-Pil. Sun-Woo decided to go to his dream place – the equator- as he decided to help Tae-Joo in restoring his investors for his coal mining business. He knew that it won’t be an easy job, but he wanted to repay Tae-Joo’s deed. 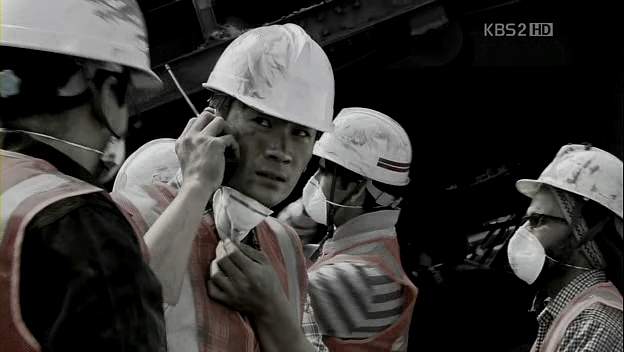 The company was in the bad state and Sun-Woo went to the mine himself to work there. The news about the company’s state was told to Chairman Jin. He’s glad to hear that Moon Tae-Joo had given up on it. Sun-Woo, on the other hand, tried his best to attract investors as he managed the workers at the mine. Chairman Jin also heard about Sun-Woo, known as David Kim after he took over Moon Tae-Joo. The tree infested with bugs will fall when the wind blows. There’s no need to chop it down; all you have to do is to become the wind. Cut to the present time, with Ji-Won talking about the dresses for the VIPs with her manager. The manager gets pissed off when Ji-Won gives her suggestion. She goes to the big hall to check the final preparation made and she doesn’t realize that Sun-Woo is looking at her, watching her actions. He doesn’t greet her and walks out of the hall, but he still has that yearning for her in his eyes. We are brought to take a look at Geum-Jool, who’s now owning a workshop. He grunts over a new car that has no faults but the owner insists that he has to check it. 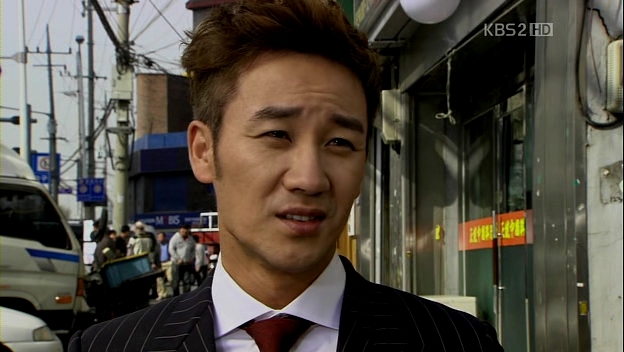 He sees someone standing in front of the workshop and goes out to meet him, only to find that the guy is his friend Sun-Woo, dressed in a fine suit. 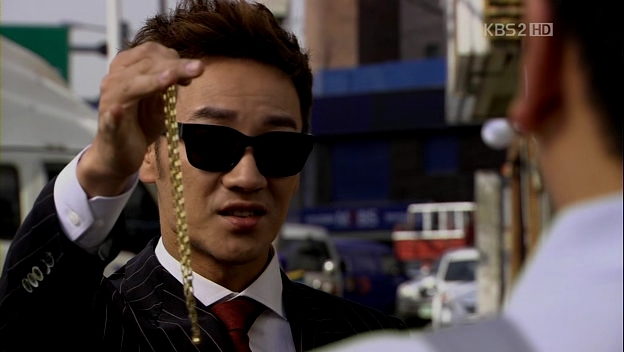 He’s speechless to see Sun-Woo there, holding out a gold necklace for him as promised. The surprise is too much for Geum-Jool as he nearly passes out to know that Sun-Woo can see him. They go for a drink and Geum-Jool is too happy to see Sun-Woo in front of him. He keeps asking questions and Sun-Woo answers everything. Sun-Woo asks for his help and Geum-Jool is surprised when he wants to find the taxi driver who brought his father to Chairman Jin’s villa. When asked about it, he just wants to know. 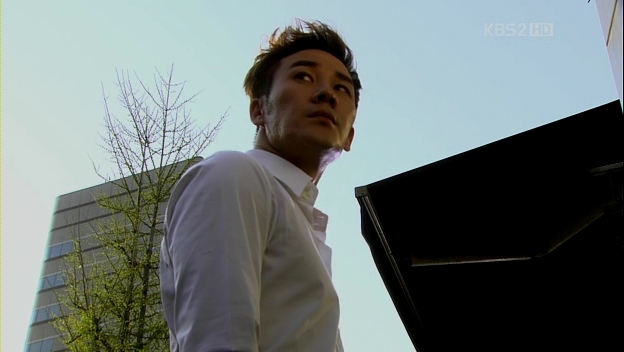 Sun-Woo goes to his hometown’s police station in Busan and takes a look at the police report about his father’s suicide. He looks troubled as he reads through the report. Another ordinary day for Jang-Il at the prosecutor office, where he’s busy investigating a case. His colleagues suggests for their team to ask for a Korean-American businessman to help them with the case, and that person is David Kim. The talk about wheelchair reminds Jang-Il about Sun-Woo and he’s suspicious to see him walking around without his cane. He gets the number from which Sun-Woo called his father that day and it turns out to be the rehab center. He makes a call to the center and coincidentally, Sun-Woo is also there. The worker doesn’t know who is the Sun-Woo that Jang-Il is asking about and he explains that a blind man can also walk around without their cane if they have the taxi to send them. He complains about the call to Sun-Woo, who comes to ask about the recording services. After finishing the call, Jang-Il is about to go back to his office when his colleague reminds him about something. 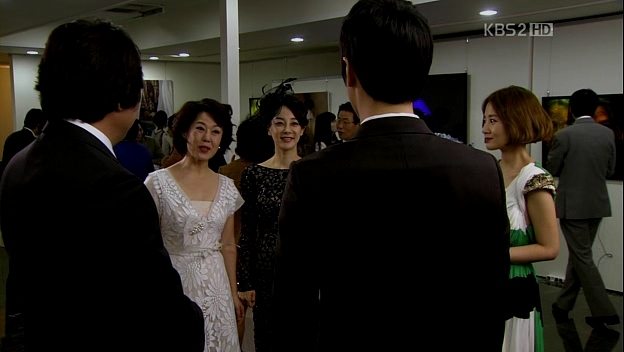 He actually has to attend his friend’s wedding at the hotel and just his luck, Jang-Il happens to see Ji-Won there. She’s there as she’s the manager and he tries to run after her but fails. He sees her talking to a man and proceeds to ask him if she’s Han Ji-Won. He’s glad to meet her again. Ji-Won is about to go home when one of her colleagues tells her about a rumor that she has receved a bribe. She meets face-to-face with her manager but the manager acts nonchalantly, leading Ji-Won to suspect that the rumor comes from the manager herself. She want to meet the director, but her manager tells her that he’s not around and she will have her salary reduced.She reminds Ji-Won not to act like a newbie there. Just as her salary gets lowered, Ji-Won receives a call from her sister, informing her that their mother need to undergo surgery. She assures her sister that she has the money, but she’s quite troubled with the recent happening. Ji-Won suddenly remembers about a headhunter’s offer for a new job. She decides to try her luck and contact the person. The bouquet of flowers makes its appearance again after a few years, but this time it has a card. It is from Jang-Il and her colleagues are gushing over his star prosecutor job while Ji-Won recalls his words for her to like him. When she asks about David Kim,they laugh and calls him grandpa as he said that he’s in his 60s, but he’s actually in mid 30. Ji-Won tells them that she has to step out for a while since she has a meeting. As if the traffic isn’t bad enough for her, it’s suddenly raining and Ji-Won gets to know that her interview is going to be conducted by the president of the company himself. She takes the subway but her luck isn’t there on that day: she gets pushed and her phone falls; she picks it and a taxi splashes some water on her. Talk about a bad hair day. She manages to squeeze some time to change her clothes before she goes to meet the president of the company. Ji-Won enters the room as the president is standing with his back facing her. She starts apologizing, but he tells her to go back as she’s not able to make it on time. He turns to face her, and she’s left speechless to see Sun-Woo in front of her. He gives the permission for her to come again for the interview and doesn’t recognize Ji-Won at all. She doesn’t say anything and walks out of the office as she keeps thinking about Sun-Woo. She realizes that he’s unable to recognize her since he couldn’t see her before this and runs back inside to meet him, but he has gone out. Much to her surprise, the guy’s name is not Sun-Woo, but David Kim: the so-called VIP at her hotel. Ji-Won remembers about the picture that she gave him and wonders if he has lost it for him to be unable to recognize her. 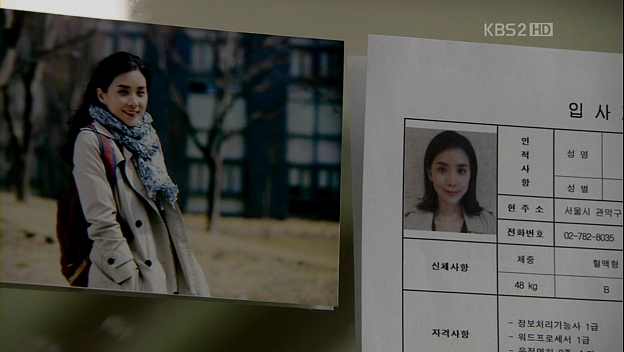 That very picture is still in Sun-Woo’s possession as he sits with his friend, comparing the picture with her picture on the resume. The friend asks why he didn’t admit that he knew her when they met and Sun-Woo thinks he doesn’t have anything to give to her even after leaving for so many years. He tells his friend to postpone his next trip to France as he wants to settle his father’s case, with the time for appeal is going to expire soon. Back at her house, Ji-Won takes out the box containing Sun-Woo’s belongings and takes a look at them. She reads his letter to her and the letter addressed to him calls for attention. There’s no return address written on the back of the envelope, but she doesn’t open the letter and puts it back into the box. Jang-Il is still busy at his office and his colleagues tell him to take a break from his workaholic life. 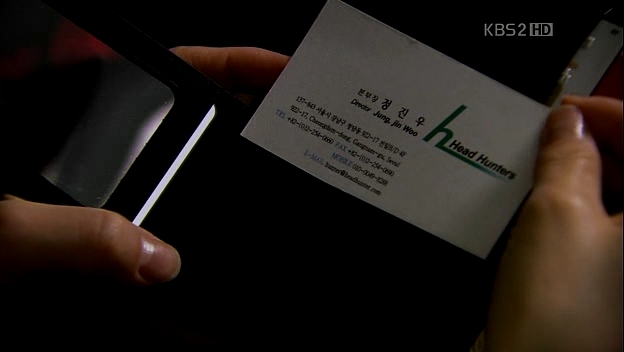 He is expecting a call from someone, probably Ji-Won, but all he got are calls about his work. Suddenly, the phone rings and his colleague answers it. it’s from Chairman Jin and Jang-Il doesn’t budge to answer it. Instead, he promises that he will call him later. Chairman Jin ends the call while Mrs Ma is fuming because of Jang-Il seems to be ungrateful since he becomes famous. However, he’s positive that he can still manipulate Jang-Il for his own benefit. He’s actually trying to get Jang-Il’s help about a prosecutor who’s trying to investigate their company. At the gallery, Soo-Mi is being interviewed about her exhibition there. She’s very sharp and detailed about everything. Yun-Joo asks whether she doesn’t have any invitation to be sent and Soo-Mi passes an invitation to be sent to Jang-Il. Both of them are surprised to know that they know Jang-Il. Soo-Mi becomes friendlier with Yun-Joo once she knows about it. Ji-Won goes to greet the David Kim at the gym at she spends some time staring at him. He comments about her mean-looking manager and assures her that he’s going to keep her secret well. Ji-Won suddenly asks him whether he remembers her voice or not. He’s taken by surprise by the sudden question but he still pretends not to know her. Yong-Bae tries to make Jang-Il join him to the opening if the gallery, but he refuses to go as he knows Chairman Jin will be there to ask for his help. 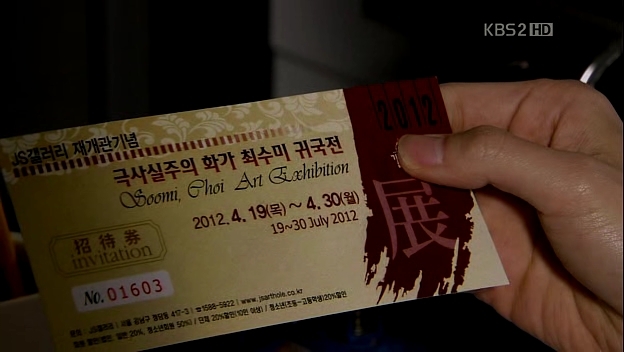 He gets the invitation for Soo-Mi’s exhibition but tosses it aside, completely ignoring it. After knowing that David Kim is not going to come on that day, he decides to go out in the evening. 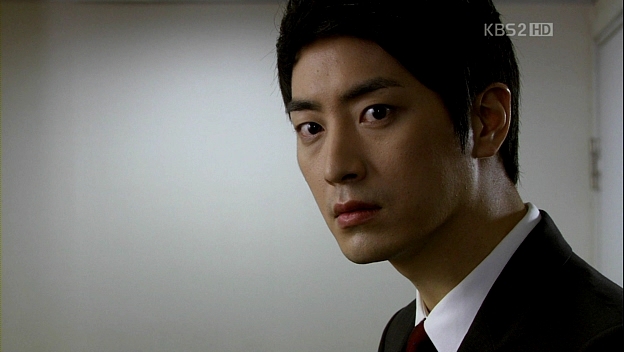 Sun-Woo gets the call from the prosecutor’s office and confirms that the prosecutor in charge is Jang-Il. He also finds out the taxi driver’s whereabouts and meets him to get the info from him. Just like what he used to do before, Sun-Woo writes down all the details he got about his father’s murder, this time in his laptop. Ji-Won comes to the room to deliver a bottle of champagne but he doesn’t care much about her. Jang-Il sets an appointment about reception consultation with Ji-Won without revealing his identity. He goes to the hotel in the evening and sees some law books on Ji-Won’s desk. She’s surprised to see him there and they proceed to discuss about his father’s birthday. He keeps staring at her and wonders why she’s reading law books and offers to help her. She doesn’t say anything to him about the books. At the opening ceremony, Mrs Ma is so happy and she expresses her liking for Soo-Mi’s art. She then welcomes Yong-Bae and introduces him to Soo-Mi, who greets him humbly. Jang-Il suddenly comes to the gallery and he’s about to leave when Yong-Bae calls him. He briefly congratulates Soo-Mi and leaves, but a painting catches his eyes. It’s a painting of a boy walking on a bridge. He looks at it with horror as Soo-Mi watches him. She ignores him when he sends her a questioning look about the painting.Jang-Il keeps looking at the painting and he recalls the day he tried to kill Sun-Woo. His face turns pale and he quickly regains his composure when he has to greet Chairman Jin. Just like he had foreseen earlier, the chairman wants him to stop one of his colleagues from investigating his company. Chairman Jin gives a subtle warning that Jang-Il will also be affected if he is to be investigated. On the next day, the prosecutors are happy to get David Kim’s help as it means easier job for them. Jang-Il is also glad for it, but not until the person arrives at the office. The David Kim in front of him is his friend, Kim Sun-Woo, all looking good and perfectly fine. From now on, it’s all fair play. Yeay! This is the moment I’ve been waiting for: Sun-Woo coming back to return the deeds of those people who made his life miserable. It is not going to be an easy fight since Jang-Il isn’t an ordinary rival to begin with. However, it’s more exciting since both of them are now on the same level and all will be fair to begin with. It’s hard enough to watch Sun-Woo being ‘bullied’ by Jang-Il when he was still blind, so this time it’s his turn to play with him, although we can never predict what Jang-Il will to in order to prevent his perfect life from being destroyed. I was anticipating the first meeting between Ji-Won and Sun-Woo and I admit I was a little upset when he didn’t recognize her. But when I realized that he’s actually testing whether she still remembers him or not, I was relieved. So both of them are expecting each other to recognize first, but in the end both doesn’t say a word. Ah! *angst* I think that Sun-Woo wants her to be sure that it’s really him, but Ji-Won still feels unsure and chooses not to check it, except the question she asked him. I’m totally okay if he decides to pursue her later, but hopefully he won’t be too late until Ji-Won is tired for waiting too long for him to make a move. There’s more reason to worry about them, as Jang-Il has met with Ji-Won. Who knows, he might try to woo her since her still likes her after all these years. I can probably be rest assured since Ji-Won looks like she won’t fall for him easily. It’s better for her to pursue the David Kim, since her first love is now a rich man, just like the type of boyfriend she’s supposed to have. Hihi. Since this episode is all about Sun-Woo, there’s so little development about Jang-Il as we all know about his star prosecutor job and he’s a genius to be one. I can imagine how disturbed he is to see the painting made by Soo-Mi, perfectly depicting what happened on that fateful day. He should be worried as she is sending him signs that she knows something. Creepy, but I love her subtle yet deep meaning behind that painting. Yes, you should be worried starting from now, Jang-Il. I can’t bring myself to hate Soo-Mi at all. I don’t know why, but for me, she isn’t trying to cling onto Jang-Il. She just wants him to acknowledge her, to treat her like a normal woman instead of ditching her so easily. She’s no less complex than him, and just like what she said to him, they are, after all, have so many similarities. We are halfway throughout the drama (provided there will be no extension) and at this point, the Choi family holds most of the knowledge about what happened fifteen years ago. They basically knows everything, but not into details. I’m anticipating what Soo-Mi and Gwang-Chun will do with what they know; whether to side with Jang-Il or Sun-Woo. One more thing: this invitation is giving me a good laugh since yesterday. Blooper detected! I had to look really, really close to see the blooper. To the untrained eye, most will miss it. On to the episode, Soo Mi made me proud!! 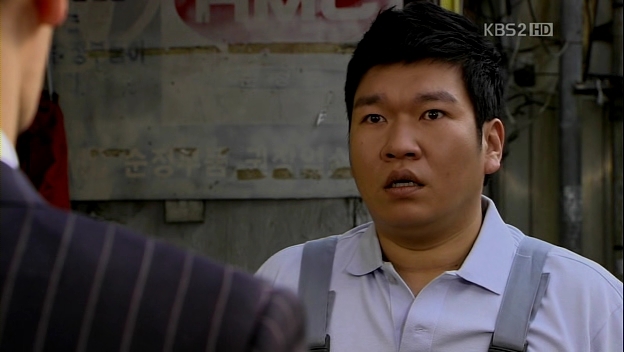 I loved the sutle dig of her knowledge and the scared look that come on Jang Il face. I personally am not worried about Ji Won/Jang Il relationship. She still looks uncomfortable with him which was obvious when she was all business and did not want to talk about her life or what she was doing. I also understand Sun Woo’s hesitance. Its been 13 years and I think he wants to see whether she still feels for him as he obviously feels for her. So looking forward to watching that relationship developed. So looking forward to the revenge developing. As far as who side Soo Mi and her Dad will be on? Who knows! The Dad will side with Sun Woo especially once he finds out he has money! And He is pissed at Chairman Jin for trying to kill me but he will try to benefit financially! Soo Mi? It depends. If Jang Il continues to treat her like dirt, it will be interesting BUT if he does what I expect, using her feelings for him to find out what she knows, that also will be interesting!! Two more days! Can’t wait until episode 11!! This episode was intense!! That blooper is funny!